It’s that time of year. You know. Zucchini. All over the place. The time when you can’t seem to get away from the squash. Maybe you’ve got that neighbor that drops by with a brown paper bag filled with squash. Or maybe you’re at the farmer’s market and the sign says 3 for $1, but the farmer puts 12 in your bag (yes, true story). For me this really isn’t a problem, I love zucchini. I can slice it up and stick it in anything or nothing at all. Just a little salt and pepper and I’m ready to go. But not everyone shares my love of squash. I get it. I have some vague bad memories of overcooked, water-logged squash which quite honestly didn’t taste so good. But I managed to get over that. 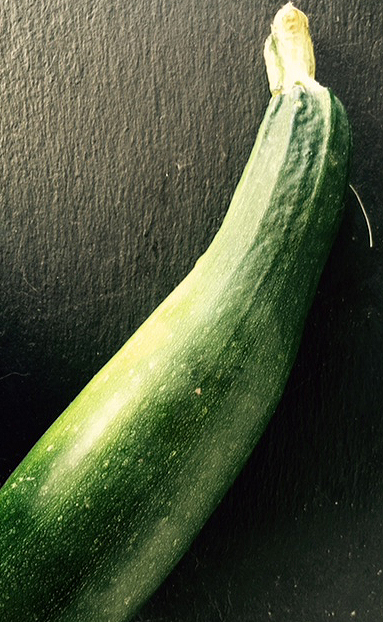 Zucchini falls under the umbrella of summer squash. Summer squash are harvested before their rinds harden so we can eat them. This is unlike winter squash such as butternut or acorn squash or pumpkin (we can’t eat the rind!). Summer squash is also very versatile as it can be eaten raw or cooked. Oh and did you know, the name zucchini is actually the plural form of the Italian word zucchino? Zucchino means “little gourd”. These “little gourds” are also known as corgettes in other parts of Europe. And I bet you didn’t know that zucchini is actually a fruit. Yup. You know why? Because it comes from a flower. A bright yellow-orange flower. An edible flower. Yup. The flowers can be eaten too! Okay, so despite all the interesting facts, you’re still not a zucchini lover, right? Well, fortunately, there are so many ways to use it that you’ll never know you’re eating it. Really. The flavor is so mild it hides well in foods. Could be because it’s is almost 95% water. Still not convinced? Eating zucchini can help keep your skin, hair and teeth healthy because it’s a good source of vitamin C. It can also help keep your blood pressure in check because it contains a good amount of potassium. Eating foods rich in potassium helps lessen the effect sodium has on our body. Convinced yet? Well, maybe this delicious recipe will convince you. It’s adapted from one of my favorite cookbooks, Jerusalem. Not only are the recipes to die for, the photography is outstanding. The recipe is for turkey and zucchini burgers, but I made mine into meatballs. The grated zucchini helps keep the meat moist and adds nutritional value. Trust me, if this recipe doesn’t convince you, I don’t know what will. Make sauce: Combine all sauce ingredients in a bowl and chill until needed. Make meatballs: Combine all ingredients in a bowl except the olive oil. Roll into meatballs, any size you like. Pour enough olive oil into a frying pan to cover the bottom and add the balls. You may need to do this in two batches depending on the size of your pan. Sear the meatballs on each side until golden brown. Transfer all the meatballs onto a baking sheet lined with nonstick foil. Bake the meatballs until cooked through, about 5-7 minutes. Serve with yogurt sauce on the side.